Anyhow, as in The Faces song “he has a lot more money than sense” – he bought his number plate for his car over 20 years ago and I was OK with that. My brother is indisputably the best brother in the world: the Collins dictionary could actually use “being like Mike” as a much better definition of generosity. He’d borne the brunt of caring for our mum as she grew old, had a young family and was working on getting Viagra approved around the world. So he didn’t want me, having been minimally involved with our family for years telling him that I was off travelling leaving him to care for our mum who was suffering from increasing TIAs. We fell out and if the Collins Dictionary was looking for a definition of a “fall out” guess what? We were travelling in New Zealand and I bought a hits of the 60’s album to listen to one track: The Hollies’ “He Ain’t Heavy, He’s My Brother”. On Christmas day in 1996 I called him from a phone box from the South Island using one of those phone credit cards. The call left me devastated by his tone and realizing how estranged we were and how much I’d damaged our relationship. We retuned to the UK and subsequently our new daughter helped things thaw a bit between us – but you could still have walked on the ice between us. Then he went on a management training course which was nothing short of transformational. He called me afterwards and simply said sorry. A year or so later Pfizer wanted to relocate him to the States to work out of New England. As mum’s health further deteriorated we moved her to a nursing home near us in Yorkshire. 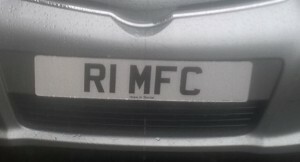 Mike wanted me to “look after his number plates” so gave us his 18 month old Saab! He shows no signs of coming back to claim his number plates and that original car was exchanged many years ago. So I’m stuck with R1 MFC and although I wouldn’t choose to have personalized plates, we’ve grown attached to them. They remind me of the most generous person I know, miss and love.